You're likely familiar with emergency plumbing situations, from burst pipes to county water line meltdowns. To help you avoid crisis mode during your next emergency, here’s how to handle any plumbing catastrophe. Stop water from flowing out of the hole by closing the main shutoff valve to your home. This stops the water supply to your home’s fixtures and, in turn, stops the flood. To control the damage, turn on the cold-water taps to drain the pipes from trapped water and steam. Once you've controlled the situation, call a plumber to repair or replace the pipes. Close the main shutoff valve to your home before the frozen pipe splits. Turn on the faucet and keep the water running at a constant slow drip. Use one of these techniques to thaw out the pipe from the end to the tap. Never use an open flame or devices with chemically flammable properties. Thermal water expansion can also cause the pipe to burst. 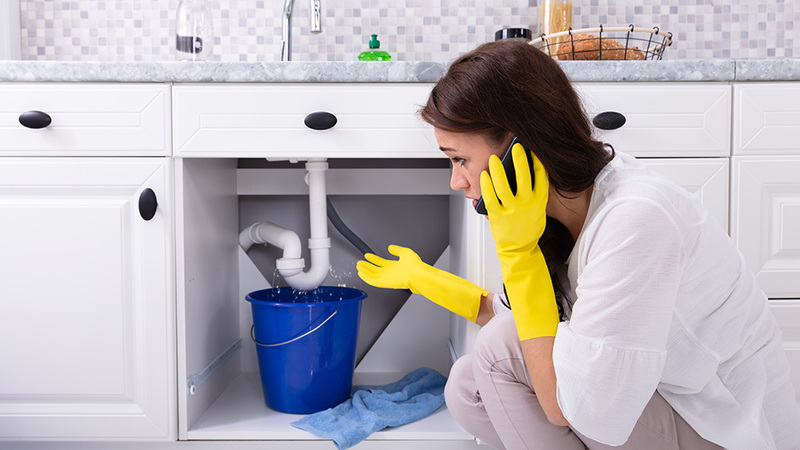 If the county water line that connects to your home breaks or clogs, contact a plumbing expert. A damaged main water line can cause a rise in pressure. This can lead to flooding in your home’s foundation. If the water does make its way to your basement, follow this step-by-step guide for clean-up. A slow drip can lead to a big plumbing problem — fast. Find the shutoff valve that’s specific to the leaky fixture. Check the fixture’s tap for debris, hair, soap scum, and food particles. These common obstructions might be causing overflow in the pipes. Next, follow Warner Service's quick guide to fixing a leak. A failing water heater could be due to a problem with electrical connections or the gas line. This can cause additional stress, because you can't bathe, cook, or clean without a water heater. If you don’t have hot water at home, contact a plumbing professional. This is one of the most common plumbing problems for homeowners. To fix toilet overflow, grab a plunger or drain snake. If you’re unsure how to use a snake, check out How to Clear a Drain Using a Drain Snake. If the plumbing problem persists, call a professional. If the county sewer line corrodes, breaks, or clogs, it could cause uneven toilet water levels. It could also cause clogged drains, wall stains, or an overwatered lawn that emits foul odors. If you come across any of these warning signs of a broken sewer line, call a local plumber for emergency help. If you smell gas, evacuate your home immediately. Gas leaks are too toxic and dangerous for a do-it-yourself repair. Once you're in a safe area outside, call an emergency plumber or gas company. Under professional guidance, the gas meter will turn off at the control valve. If the washing machine’s drain and/or hose damages, it could cause flooding throughout your home. Using too much or the wrong laundry detergent can also cause water damage. This is also true for running a high-efficiency machine for too long. If you see an overflow of soapsuds, open the floor drain or call in the plumbing pros. It’s best to minimize residential plumbing damage with regular maintenance. Yet emergency plumbing situations can happen at any time. It's best to have a professional plumbing company, like Warner Service, on standby.